Hey everyone! 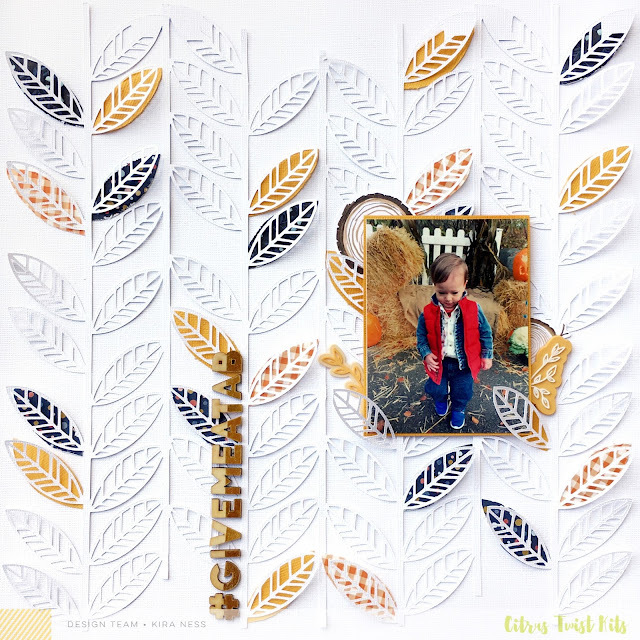 Kira here to show you a couple layouts I created with the Fall Harvest Add-on Kit. Any other fall lovers here? It is definitely my favorite season, but it's my first year in San Antonio and apparently Texas hasn't received the memo that it's October. Lol. It's 90 degrees as I type this. Anyway, I pulled out some older photos to work with to get me in the fall scrappy mood. The first layout I created was for a few pictures of my son picking out his pumpkin last year. He picked it out by giving it a kiss. Awwwww! I created the large title on my Cricut and used that gorgeous blueberry paper that was included in the kit as my background paper. I backed the cut out title with the orange and white plaid paper (B-side of "Whirling Leaves"). I decided to add some hand stitching around the word "pumpkin" in a blue that matched almost perfectly to the background paper. It added the perfect amount of textural detail to my page. I'm going to be completely honest here though...the stitching was a nightmare. This layout gave me so much grief and I've never had as many issues with the stitching ripping the paper as I did on this layout. I had to cover up one of my "happy accidents" with a fussy cut pumpkin from the "Pumpkin Patch" paper. But it looked so cute, that I added a few more around the page! I brought in more of that pumpkin paper by tearing the blue cardstock and tucking the pumpkin paper underneath. I stitched it down with the blue thread and just loved how it looked! I added a few of the rubber charms from the Amber Moon collection, which was such a fun added piece of texture. I finished off the layout by adding some of the Perfect Autumn enamel dots under my title and under the little torn flaps. And finally I added some white paint splatters around the page. After I finished this layout, I still had so much product left! And was still totally in fall mode. So I decided to make a quick layout of my son in his Halloween costume from last year. Can you tell who he went as?! My husband and I are big 80s pop culture fans...so we dressed our kids as Marty McFly and Doc Brown (my baby was THE CUTEST Doc Brown!). I started with some white textured cardstock and decided to use this leaf cut file, also cut from white textured cardstock on top. I used a few of the patterned papers from the kit to back a few of the leaves, creating a scatter of color across the page. I didn't glue the cut file to the patterned paper leaves to give it a bit of added dimension. I backed my photo with the Dandelion cardstock and added a few pieces of ephemera from the 1canoe2 die cut pack, along with a few of the rubber charms to create two clusters around my photo. Then I added my title using the Escape the Ordinary Golden Foil Wood Alpha Stickers. Bonus points if you get the reference. Thanks so much for joining me today! And make sure to check out the Add-on kit this month! You will not regret it! Both of these layouts are gorgeous!! Stunning layouts. both. Especially love the white cut leaves on white.